This is what happened last Sunday. 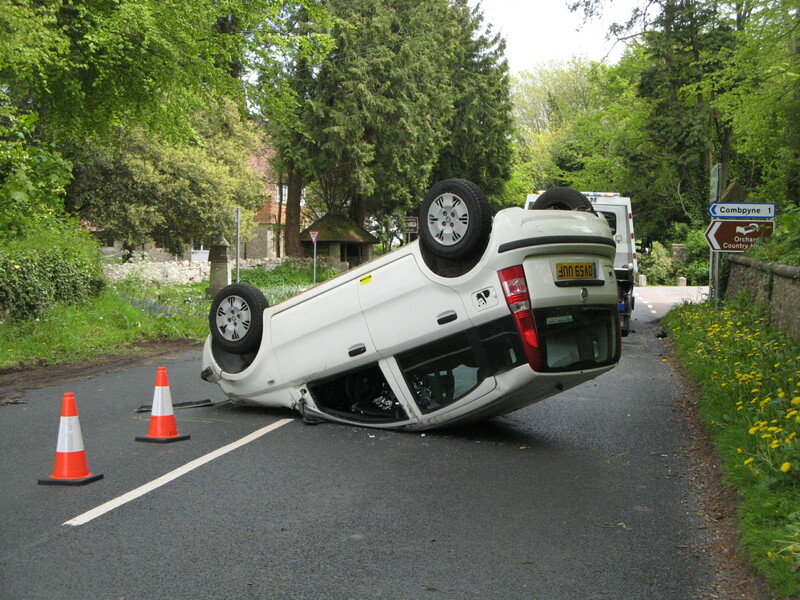 I was driving happily along a mainish road in Devon, having just gone to enjoy the best displays of bluebells to be found in the area when someone came out of a side turning without seeing me (a traffic sign obscured the view of oncoming traffic) and hit my car. This propelled it up a bank, into a wall, and it rolled down into the road on its roof. And the thing is, I was unhurt and from then on the experience was entirely positive. People came to help. Lots of people. Someone released the seat belt so I could brace myself against the roof and not drop down. Others helped me crawl out – the driver’s side was the only undamaged part, which is why I was uninjured and the door could be opened. They insisted on covering me in a blanket, calling an ambulance, and strapping me to a stretcher and all that sort of thing, but once they agreed that I really was OK and knew the day of the week and so on they let me get up. And there was the driver apologising. So distraught at what he’d done and so concerned. And so sorry. And that’s what made all the difference. Yes, it was ‘his fault’ but no one wants to cause an accident and it must have been horrendous watching it. Worse really than for me since I was just hanging on and waiting for it to stop. You hear so many stories of drivers refusing to say sorry or admit fault because that’s what the insurance companies tell them to do. But because this man did apologise I wouldn’t dream of pressing a claim (oh yes, I’ve been contacted by lawyers) nor of blaming him. We ended up having a hug. And you know what? It’s the second time I’ve had a hug from a driver who hit my car and apologised. The last time I was able to show him that just contributing yet another dent to a pattern of dents was no big deal. It’s only a car. 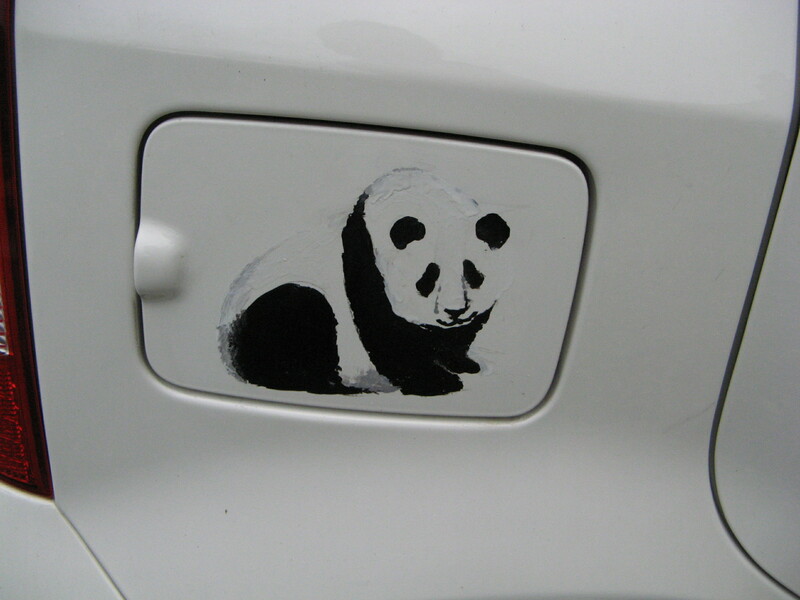 I’m sad about my Panda though, because it had been pandarised. I’d painted three pandas on it (you can just see this one on the first picture) and had only the previous day painted a fourth, rather smiley panda, on the front. But cars can be replaced. What can’t be replaced is my faith in the innate goodness of most people, and the proof, once again, of the power of an apology. We’ll done! You’re an inspiration to us all! I’m from Poole in Dorset and was enjoying a Sunday drive in Devon. And I’ve just bought a replacement Panda – sky blue this time! Thanks again to you and all your lovely neighbours. My name is Sharon and I was at the roadside with you the day your ‘pandarised’ car, and your good self, ended roof down on that Devon Road. I was concerned for your well-being, so trawled the web in the hope I might come across some news as to your progress; and here you are fit, well and in good spirits. I am so relieved. It is evident from your report that you are a strong, determined and good humoured lady. Sorry about the car but I’m glad you’re still here to tell the stories in your own special way.